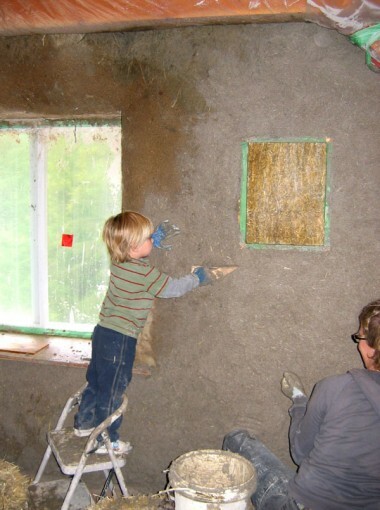 When it comes time to plaster a straw bale house, have a party and invite all your friends, family, and neighbours! Many of the tasks can be learned quickly, and the more people that come, the more fun everyone has. Even the owners’ three year old son couldn’t resist slapping on some gloves and getting a little muddy. In the past, a community would gather to help a family build their house or raise their barn. Straw baling and plastering are great ways to resurrect this community spirit, since much of the work is labour intensive but can be learned and executed by many different people with minimal training. You could also host a workshop and invite volunteers who want to learn how to build with natural materials. Including volunteers or help from friends and family is a great way to build within a budget. The key is to have an experienced natural building contractor who will be on site to organize, train, and oversee the work of volunteers to ensure the quality of the finished product.